As I indicated in my last post, I found problems with the engine after my last track event, those being an overheated cylinder head and a spun rod bearing. Since this was a fall event, I decided to get started on my winter refurbishment of the car. The first thing I did was have a full cage installed in the car. This work was done by Chris Schimmel at Competition Cages, in Hillsborough, NC. See my post on that work here. After I got the car back from Chris, I put it up on the lift and proceeded to pull the front and rear suspension, the torque tube, transaxle, and the gas tank. My first job was to clean out the gas tank. I had purchased a gas tank repair kit from POR-15. This kit includes a cleaner, a rust neutralizer, and a sealant. The full kit would be appropriate for a tank that had pinholes. Upon inspection, my tank wasn’t that bad so I just used the cleaner, which will remove varnish and dried gas gunk. Although my restoration side always wants to bead blast and repaint everything I touch, in this case the paint on the gas tank was in good shape and it is pretty well hidden from sight anyway. After drying out the tank overnight with a hair dryer, I put it back into the car. I had replaced the sump screen or “sock” last year. After being cleaned off, it was still in good shape. Normally the gas tank vents to the charcoal canister in the front of the car. I had previously disposed of the canister and left the tube to it open to the air. 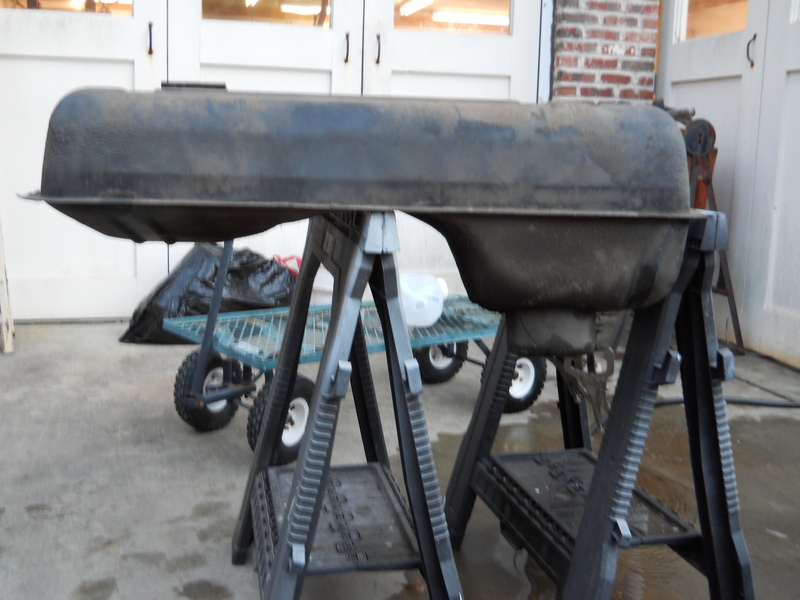 I had noticed at track events that a vacuum was forming in the tank. There was a whoosh of inflowing air when I released the fuel cap. I confirmed that the vent lines (there are 2 of them) were clear. I used some hardware and fittings to tee the 2 vent lines into a single line. I drilled a hole over top of the cap and put in a bulkhead fitting that connects to the vent hose. So now the tank vents just above the gas cap. I inspected the torque tube and transaxle. Everything seemed to be in good shape. I had to purchase a 17mm hex key socket (not a common item in my toolbox!) to get the fill and drain plugs out. I refilled the transaxle with Mobil1 75/90W gear oil. I evaluated the shift linkage. I replaced the shift lever, the plastic bushing at its base, and the rubber O rings at the transaxle end. I temporarily reattached the shift lever to the torque tube and confirmed that the linkage was working properly. I pressure washed everything and painted the torque tube with rust converter paint that I purchased from Eastwood. 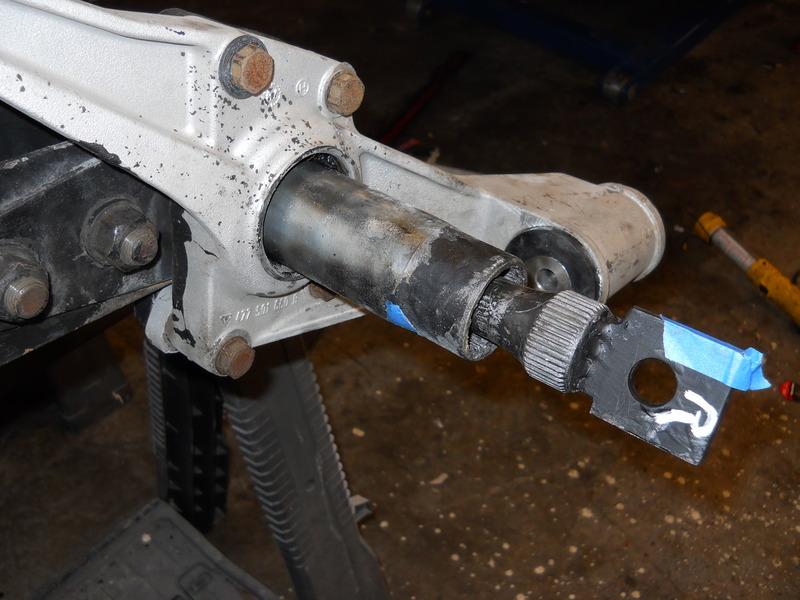 I then turned my attention to the torsion bar tube, trailing arms, and rear hubs. First I dis-assembled everything and pressure washed the metal parts. Since bead blasting aluminum parts gives such immediate satisfaction to the eye, I did so to the torsion tube chassis mount. Everything else got a coat of Eastwood rust converter. I then turned by attention to the rear hub bearings. The directions on Clarks Garage were sufficient to understand how to do the job. You can probably do it with just a heavy vice, hammers, and punches. It is easier with a press. I had a bad moment when I realized that the bearing clearance was established with snap rings of various thicknesses. Fortunately, nothing had changed since the factory did it and the same snap ring they had installed then gave me a satisfactory clearance. Somewhere during this process, I decided to replace all of the rubber bushings with polyurethane ones. I ordered most of the bushings I needed from Powerflex USA. They didn’t offer the bushings for the torsion tube carrier, so I got those fabricated from delrin from Weltmeister via Paragon Products. I believe that the poly or delrin bushings are legal for Spec944. Full metal bushings are not. 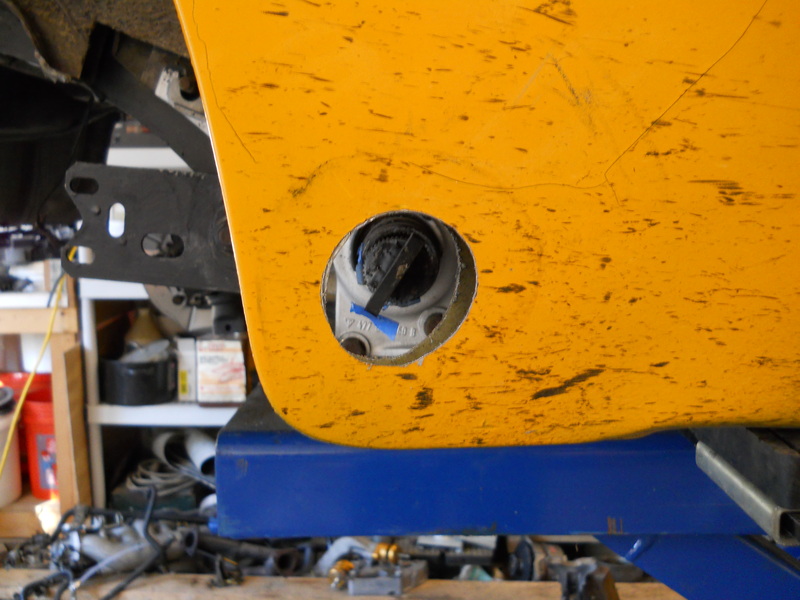 Getting the trailing arm bushings out was difficult with hammers, chisels, and saws. I had another bad moment when the new bushing appeared to be too big. I finally discovered that the outer metal sleeve of the original bushing was still in place. Once I got that out, the bushing fit fine. 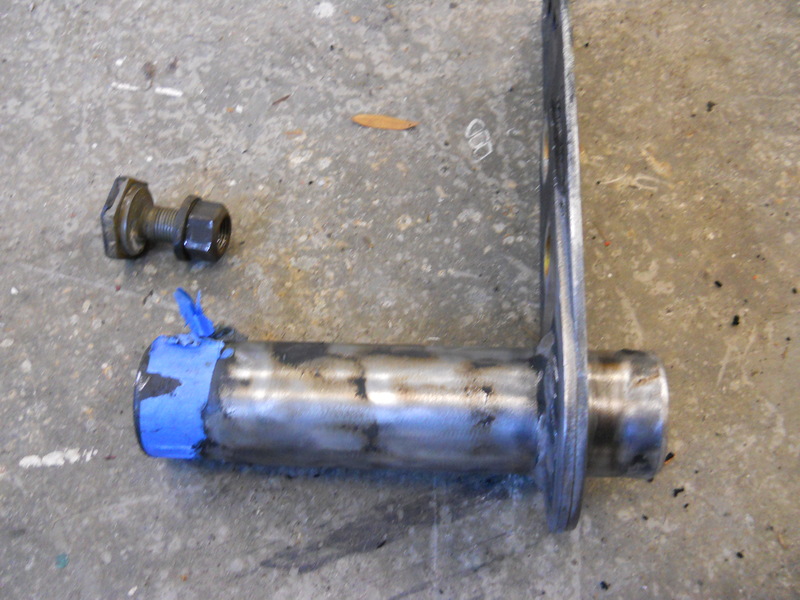 The torsion tube carrier bushings (inner and outer) didn’t lend themselves to any obvious means of extraction. I tried burning them off with a propane torch. They just laughed at me! The final solution was a tool in my arsenal that I fear and respect, that being my Mikita electric grinder with an 8″ wire wheel and no guard. A true implement of mass destruction, this is the only tool that I have found effective for removing undercoating and certain types of paint. I tackled these bushings, which fortunately are not encased in steel shells. A blizzard of abraded rubber bits ensued, much like the clag that build up on the outside of corners at the track. Eventually every bit of the bushings lay on the ground and the shaft was bare. Victory! 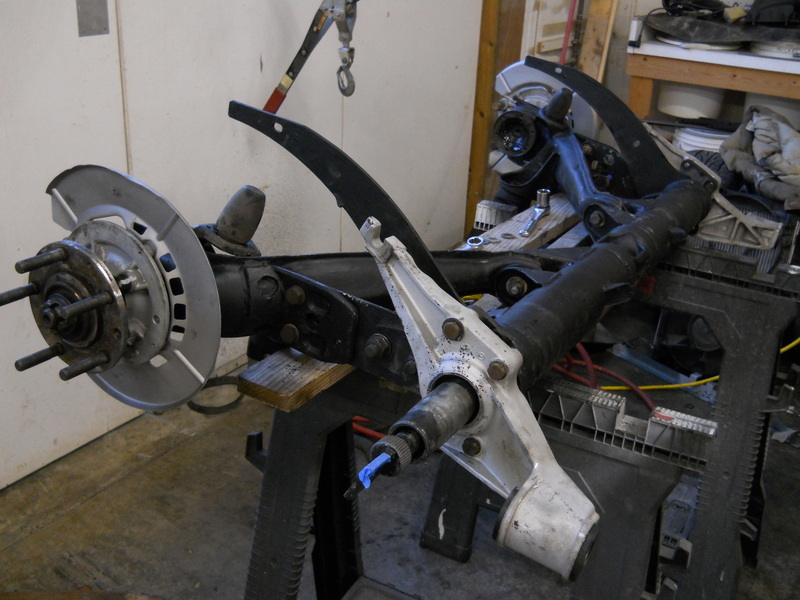 It was time to re-assemble the torsion bars, carriers, trailing arms, and hubs. But one job remained. I welded a tab on the end of the torsion bars to enable their quick removal. This and a matching hole in the fender allow me to remove the torsion bars in a matter of seconds. I installed the bars and mounted some tires and lowered the car to the ground. Not that I was trying for this look but I had a real lowrider! I think the ground clearance was about 2″. I lifted the car back up and reset each bar very easily. This time the ride height was in the ball park. Final setting of the ride height remains for after the engine and other significant weight components are added to the car. In my next article I will write about checking the camber and toe characteristics of the rear suspension, as well as establishing a centerline for the suspension and subsequent alignment.